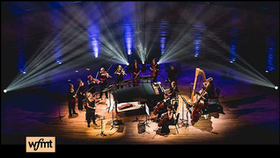 Angèle Dubeau & La Pietà is a string orchestra with piano, composed of all top-ranking female musicians, amongst the best in the country. The excellence, precision and strength of each one, as well as the closeness that they have with each other, grant them an exceptional ensemble sound and contribute to the communicative pleasure that the orchestra imparts. Host Lisa Flynn curates the best new classical recordings to share with you each day of the week at 10:00 am. 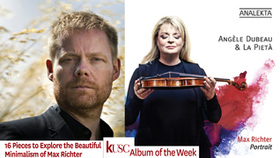 There's always wonderful music discover on New Releases, from instrumental to vocal music, new recordings of old favorites, or albums featuring cutting-edge contemporary works. 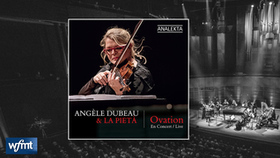 For December 30, 2018, the WFMT: Chicago 'Featured New Release' is Angèle Dubeau & La Pietà: Ovation Recorded live in concert, "Ovation" features works by Ludovico Einaudi, Max Richter, Philip Glass, Ennio Morricone, George Enescu, Joe Hisaishi, Camille Saint-Saëns, and Srul Irving Glick. Angèle Dubeau writes of this release: "This album, recorded live at Quebec City's Palais Montcalm in November 2017, features some of the most striking works that La Pietà has performed during its 21 years of existence. I gave my first concert at the age of five, and 51 years later, I would like to say thank you, because after all these years, what fills me with joy is knowing that my music is there with you, both in your everyday life and in the special moments. Thank you for all of these experiences. Enjoy!" 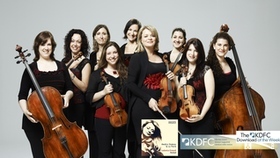 Each week KDFC: San Francisco eNotes members can download a free mp3 from some of the biggest releases in the world of Classical music. Celebrate KDFC at the Movies with a special cinematic free download! This week, grab your free mp3 of Angele Dubeau & La Pieta performing selections from Harry Potter. 2017 highlights Angele Dubeau's 40 year career and the 20th anniversary of La Pietà. This is also the groups 40th album, a film music double album.The choice was great and the violinist let herself be challenged by strong, beautiful and evocative music. Some of these melodies are rather sweet and savory other, covering the whole range of emotions. 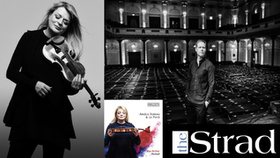 Portrait is a string of recordings presenting contemporary composers with a unique musical signature. Ludovico Einaudi is one of them. A music that captivates the listener, a sonic landscape to discover"says Angèle Dubeau. 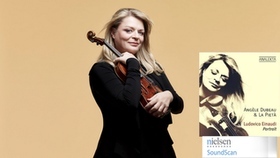 Driven by the works of this grand and prolific Italian composer, the internationally renowned violinist shares once again her passion with the excellent musicians of her string orchestra, La Pietà. For her 39th album in career, Angèle Dubeau offers a unique revisit to Ludovico Einaudi's music, "changing its texture, rethinking its character, while bringing a new sonic dimension." Ludovico Einaudi: Portrait was voted one of Itunes best Classical Albums for 2015. Angèle Dubeau & La Pietà received yesterday a Félix award in the category "Album of the Year - Classical / Orchestra and Large Ensemble" for the album LUDOVICO EINAUDI: PORTRAIT. The Félix awards are Québec's equivalent of the Juno awards in Canada and the Grammy awards in the United States. This prize is Angèle Dubeau's 15th Félix award in her career and shows that, in her quest for excellence, she has always been able to renew herself and generate public interest for her music. Inspired by the works of the great and prolific Italian composer Ludovico Einaudi, the internationally renowned violinist offers, for her 39th album, a unique interpretation of his music, "changing its texture, rethinking its character, while bringing a new sonic dimension." To date, the works from the album LUDOVICO EINAUDI: PORTRAIT have been streamed more than 5 million times throughout the world and the works from Angèle Dubeau's discography have been streamed more than 15 million times. These are impressive results for a classical artist and they testify to her international success and stature. 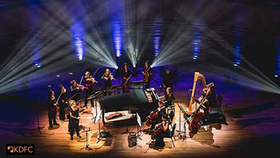 Angèle Dubeau & La Pietà will perform works from the albums BLANC and LUDOVICO EINAUDI: PORTRAIT at the Palais Montcalm in Quebec City this Thursday, October 29 and at the Maison Symphonique in Montreal on November 13, 2015. The complete list of concerts is available at: angeledubeau.com. & La Pietà received yesterday a Félix award in the category "Album of the Year - Classical / Orchestra and Large Ensemble" for the album LUDOVICO EINAUDI: PORTRAIT. 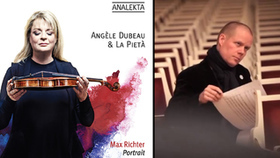 Known for their exceptional virtuosity and impeccable precision, Angèle Dubeau & La Pietà have crisscrossed the world for nearly two decades. 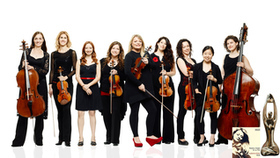 Founded in 1997, the all-female string orchestra features some of Canada's best musicians. Ms. Dubeau's virtuosity, musicality and uncommon gifts as a music communicator has produced a dazzling career in the great concert halls of the world, and the violinist has sold over 500,000 albums worldwide. For her 39th album, Angèle Dubeau offers a unique revisit to Ludovico Einaudi's music with the La Pieta release - Ludovico Einaudi: Portrait. Working for the unique musical signature of Einaudi, "the music captivates the listener," say Dubeau. It's a sonic landscape to discover with changing texture and character. The Einaudi: Portrait has been Top 20 charting on Soundscan's Current Classical Traditional chart for much of the past 23 weeks and tracks from the album have already been streamed over 1 million times in the US. Einaudi: Portrait has been on the Canada Classical chart for 33 weeks, 8 times at #1 and the album has now sold more than 11,000 copies. Angèle Dubeau & La Pietà played The Dakota in Minneapolis last week and took the time while in town to stop by Minnesota Public Radio for a perf/chat and concert. New Classical Tracks is a Syndicated Feature airing Nationally on Classical 24 & Statewide on Minnesota Public Radio. Listen to Julie Amacher's Feature with Angele Dubeau. 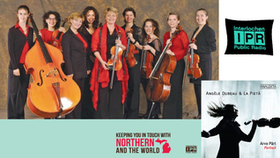 READ THE TRANSCRIPT - Canadian violinist Angele Dubeau recently released her 39th recording. She's a very prolific artist perhaps because of the advice she received while studying with Dorothy Delay at the Juilliard School of Music, "First, she showed me how to develop by myself because I was of course still young, 15 or 16. And before that the teachers were giving me all the answers to my questions. But she started to open my mind and widen my horizons saying, no, you will have to make the choice later in your career. So she was giving me more freedom with what to do, the musical intention." Angele Dubeau's intention is to explore various angles of classical music, from Vivaldi to video game composers. Over the past ten years she's also developed a series of musical portraits of living composers. Her most recent celebrates the music of Italian composer Ludovico Einaudi. "He's a master of the melody and for sure his works dwell in the notes for a long time," Angele explains, "You hear him once and you're hooked. And this happened to me and of course I'm sure happened to everybody who is listening to this music. He's a divine storyteller in music." After meeting Ludovico Einaudi in Montreal last fall, Angele quickly gained his approval to move forward with this project. Choosing the right pieces became a creative and personal challenge for Angele who was diagnosed with breast cancer in January 2013. It was during that difficult time when she first discovered the healing music of this composer, "Well, of course when I saw the two titles, Life and Experience, I thought first that it was very evocative for that period of my life. From Life, what I know because I went through with Mr. Einaudi a little for each piece, he told me in that particular piece, he was inspired by the folkloric element in the music. So when you listen to this piece, you can see that the violin is really in the center of the music, I would say, it's just like I would be a fiddle player, just going with all those breaking chords and going very fast and many notes to play. Mr. Einaudi is a pianist and his compositions are composed for solo piano with accompaniments," Angele explains, "So here in my album I wanted the violin to be at the center of the music so that's why I revisited the structure, made some cuts, adding here and there things to give a new aspect and in a way, respecting, of course, the original writing of Mr. Einaudi. I think this new CD, this album of Portrait, is bringing the strings into the portrait, and definitely opens up the work to an entirely different sound." The piece titled, ‘Experience,' is a perfect example of how this new sonic landscape was revealed. Angele created this challenging arrangement with her friend and colleague, Francois Vallieres, "He came with a first version, I tried it, I played it with La Pieta, and then I came to him and said, this doesn't work. Mr. Einaudi used, of course, the piano but sometimes rhythm section or electric instruments. So we had to go through and find a way to open up the work to complete an entirely different sound of what he already did." The sky's the limit. That's how Angele approaches the world and classical music. Good music, is good music. And she adds, so much great music is right at your fingertips, "And it is the case with Ludovico Einaudi which I discovered two and a half years ago. I was just listening. I love to do those exercises, just to go on the internet and go and try to discover new works and new composers. And that's where the music of Einaudi just spoke to me directly and I thought, oh, it's really a composer that I am fond of and that I want to explore more of his repertoire. So now the album is done, yes." ‘Portrait' is a series of recordings presenting contemporary composers with a unique musical signature. Ludovico Einaudi is one of them. Angèle Dubeau says, "This grand and prolific Italian composer creates works that dwell within us for a long time. A music which captivates the listener, a sonic landscape to discover. Starting from the original versions, I wished to explore these works with my violin, surrounded by the wonderful musicians of my string orchestra La Pietà. This is a revisit of his music, changing its texture, rethinking its character while bringing a new sonic dimension." 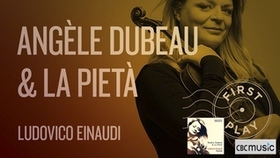 Divenire (7:04) from Angèle Dubeau | La Pietà: Ludovico Einaudi, Portrait is a WFMT: Chicago - New Release Of the Week. 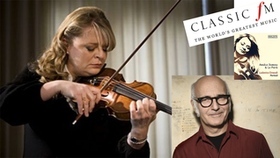 One week after the launch of her latest album Ludovico Einaudi: Portrait, violinist Angèle Dubeau finds herself at the top of Soundscan's classical music sales charts in Canada and in sixth place on the general album sales chart in the province of Québec. "Portrait is a string of recordings presenting contemporary composers with a unique musical signature. Ludovico Einaudi is one of them. A music that captivates the listener, a sonic landscape to discover" says Angèle Dubeau. Driven by the works of this grand and prolific Italian composer, the internationally renowned violinist shares once again her passion with the excellent musicians of her string orchestra, La Pietà. For her 39th album in career, Angèle Dubeau offers a unique revisit of Ludovico Einaudi's music, "changing its texture, rethinking its character, while bringing a new sonic dimension." 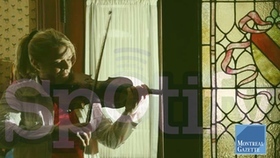 According to Soundscan, Angèle Dubeau is the classical violinist who sold the most albums in North America in 2014 and is the second best selling classical soloist behind Yo-Yo Ma. 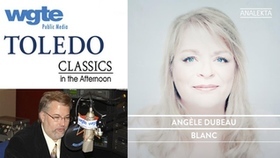 Additionally, Angèle Dubeau's albums rated in the Soundscan end of year Top 100 classical music chart in Canada represent almost 10% of all the sales on that chart. 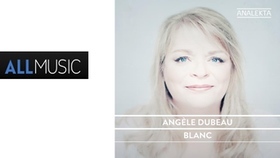 With Angèle Dubeau's 38th album - BLANC - the violinist once again demonstrates her great musicality and virtuosity winning - iTunes-Canada 'Best Classical Album of 2014.' Joined by La Pietà, Dubeau focuses on BLANC as musical purity and serenity, referring to it as - "Luminous music that can bring interior peace through it's strength and powerful evocation." An Analekta release, contributing composers on the disc include - Garry Schyman, Osvaldo Golijov, Adrian Munsey, Marjan Mozetich, Joe Hisaishi, Ennio Morricone, Mark O'connor, Ryuichi Sakamoto and Dave Brubeck. The old saying goes, "What doesn't kill you makes you stronger." Angele Dubeau is living proof. An acclaimed violinist and leader of the ensemble La Pieta, Dubeau's story is both hopeful and enlightening. 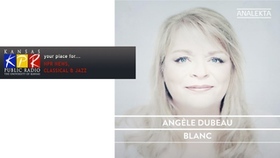 On the webpage highlighting her new Analekta Records release, Blanc, Angele says, "BLANC like purity and serenity. BLANC for luminous music that can bring interior peace through its strength and powerful evocation. Fully charged emotions that reflect the strange solitude found in illness. After months of battle against breast cancer, music has been my focal point, it has brought me comfort, tranquility and sometimes, an essential escape. This music is of Brubeck, Dompierre, Golijov, Hisaishi, Morricone, Mozetich, Munsey, O'Connor, Phillips, Sakamoto, Schyman and Stevens. A music without artifice, real and filled with hope. This album tells my story, the story of a woman like many others who had to fight against illness and, serenely, came out of it stronger." A favorite guest of Crossover, Angele returns to the show and speaks with Jill about the struggle through despair, loneliness, and eventual triumph. We'll also hear some of the music from her new CD. Listen to the interview on Philadelphia: WRTI - Crossover with Jill Pasternak. 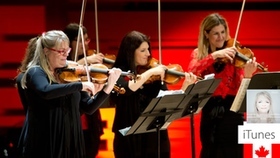 In January of 2013 Canadian violinist Angele Dubeau was diagnosed with breast cancer and was forced to cancel concerts for the first time in her life. When she heard from so many fans after the announcement, she knew she wanted to channel hope through music for her 38th recording. "Blanc, like purity and serenity. Blanc for luminous music that can bring interior peace through its strength and powerful evocation. Fully charged emotions that reflect the strange solitude found in illness," Dubeau writes in the liner notes of Blanc. Hear KUAF - Fayetteville AR's Katy Henricksen's interview with Ms. Dubeau all about the new release and how she found music without artifice. 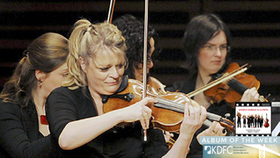 In January of 2013, Canadian violinist Angèle Dubeau was diagnosed with breast cancer. Following invasive surgery, she spent five months in treatment, which meant a five-month hiatus from playing her instrument. "You should have heard the first notes I played," Angèle recalls, "I remember. I was in my room and I took my violin and you know what? No one could have put more emotion per second in a note with a musical instrument, that's for sure." 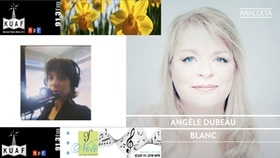 The notes are now spilling out of Angèle Dubeau, who is sharing her story on her latest recording, titled Blanc. 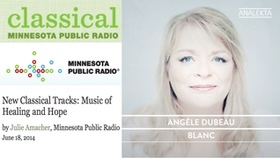 Listen to Julie Amacher's interview with Angele Dubeau on Classical MPR: New Classical Tracks. In 2013 Canadian Violinist Angèle Dubeau took a hiatus from her busy performing and recording schedule to face a cancer diagnosis. Her latest recording, BLANC, chronicles her journey back to health. Ms. shares thoughts on her efforts with K-BACH's Jane Hilton. 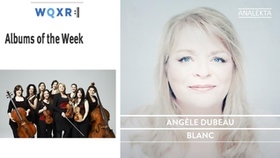 WCPE - Wake Forest NC Tara Byelick recently spoke with violinist Angele Dubeau about her 38th and "most personal album" yet, Blanc. Following her diagnosis with breast cancer last year and in response to the many supportive letters she received WCPE's Preview! presents Violinist Angele Dubeau. 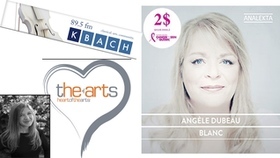 Violinist Angele Dubeau recorded BLANC after months of her battle against cancer. She says: "BLANC like purity and serenity. BLANC for luminous music that can bring interior peace through its strength and powerful evocation. Fully charged emotions that reflect the strange solitude found in illness. This music is of Brubeck, Dompierre, Golijov, Hisaishi, Morricone, Mozetich, Munsey, O'Connor, Phillips, Sakamoto, Schyman and Stevens. A music without artifice, real and filled with hope. This album tells my story, the story of a woman like many others who had to fight against illness and, serenely, came out of it stronger." Ms. Dubeau talks with WGTE - Toledo OH Brad Cresswell about her new album, Blanc (white), a project born of her recent struggle with breast cancer. For each album sold on Analekta.com, $2 will be given to the Quebec Breast Cancer Foundation. 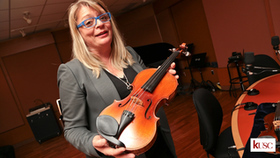 Violinist Angele Dubeau recorded BLANC after months of her battle against cancer. She says: "BLANC like purity and serenity. BLANC for luminous music that can bring interior peace through its strength and powerful evocation. Fully charged emotions that reflect the strange solitude found in illness. This music is of Brubeck, Dompierre, Golijov, Hisaishi, Morricone, Mozetich, Munsey, O'Connor, Phillips, Sakamoto, Schyman and Stevens. A music without artifice, real and filled with hope. This album tells my story, the story of a woman like many others who had to fight against illness and, serenely, came out of it stronger." 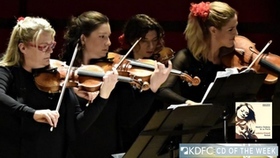 Kansas Public Radio's Mark Edwards recently spoke with the Canadian violinist about her latest project, "Blanc." Click on "listen" to enjoy the conversation! 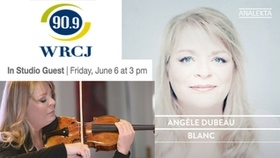 Violinist Angele Dubeau will join Chris Felcyn on The Well-Tempered Wireless to talk about her latest recording, Blanc. The album grew out of her on experience with breast cancer. "After months of battle against cancer," she writes, "music has been my focal point. It has brought me comfort, tranquility and sometimes, an essential escape. This album tells my story, the story of a woman like many others who had to fight against illness and, serenely, came out of it stronger." Tune into WRCJ: Detroit on Friday, June 6th at 3pm EDT to listen to the interview. Each month, WCLV: Cleveland Program Director Bill O'Connell selects a series of special CDs to be featured on the air throughout the month. For May Bill has selected Blanc by La Pietà led by Angèle Dubeau on Analekta and is Featuring on Tue 5/6 Thu 5/15, Mon 5/26. Angèle Dubeau writes of this disc: "Blanc like purity and serenity. Blanc for luminous music that can bring inner peace through its strength and powerful evocation. After months of battle against cancer, music has been my focal point; it has brought me comfort, tranquility and sometimes essential escape. This music is of Brubeck, Dompierre, Golijov, Hisaishi, Morricone, Mozetich, Munsey, O'Connor, Phillips, Sakamoto, Schyman and Stevens. Musical moments without artifice, real and filled with hope. This album tells my story, the story of a woman who, like so many others, had to fight against illness, and, serenely, came out of it stronger." Each week KDFC - San Francisco eNotes members can download a free mp3 from some of the biggest releases in the world of Classical music. 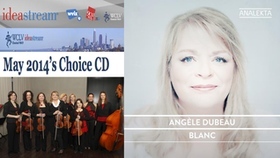 With her latest release, Blanc, violinist Angele Dubeau pays tribute to "everyone who has found strength and serenity through the trials of life." Dubeau recently survived a battle with breast cancer and credits music with helping her to stay the course. This week's Download is Dubeau and La Pieta performing Joe Hisaishi - The Rain. 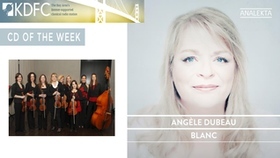 This week's featured releases includes violinist Angèle Dubeau and her ensemble La Piéta performing introspective folk, pop and jazz arrangements. 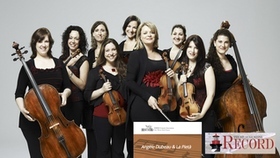 Roughly a year ago, the Canadian violinist Angèle Dubeau was diagnosed with breast cancer. 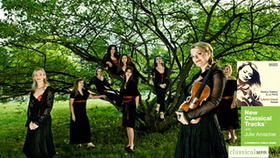 After taking some time off, she's picked up the violin again and resumed work with her all-female string ensemble La Piéta. Last month the group released "Blanc," a collection of soothing contemporary pieces that the violinist turned to as she's battled the illness. The collection features 14 pieces from 12 artists including some varied folk and jazz arrangements – of Cat Stevens, Shawn Phillips and Dave Brubeck – and three international film composers – Ryuichi Sakamoto, Enio Morricone and Joe Hisaishi. 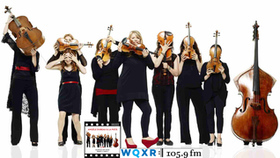 The most familiar names to WQXR listeners may be the Argentine-American composer Osvaldo Golijov and the fiddler-composer Mark O'Connor, each of whom represented with one of their quieter efforts. The mood stays introspective throughout and while some might find this to be a heavy dose of serenity, there's no doubting its heartfelt inspiration. What's more, a portion of the proceeds go towards breast cancer research. 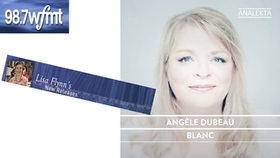 Angèle Dubeau and La Pietà are back with another CD of short contemporary works on BLANC (Analekta AN 2 8737), a disc very similar to her Silence, on joue! CD from two years ago. That the approach seems to work so much better this time is almost certainly due to the fact that BLANC celebrates Dubeau's return after a year spent battling cancer. In the booklet notes, Dubeau says that during her battle, music brought her "comfort, tranquility and sometimes, an essential escape." The album is the story of her fight against illness, and how she "…serenely, came out of it stronger." Perhaps not surprisingly, then, there is much more of a sense of program here, plus a real feeling of emotional involvement – and, indeed, of serenity and strength. There are 14 tracks on the CD, with Osvaldo Golijov's Close Your Eyes, Adrian Munsey's The Distance Between and Marjan Mozetich's "Unfolding Sky," from his Postcards from the Sky, sounding particularly beautiful. Cat Stevens' Morning Has Broken and Mark O'Connor's Appalachian Waltz are presented in lovely arrangements; there are two pieces by Dave Brubeck and one by Ennio Morricone. Also represented are Garry Schyman, Joe Hisaishi, François Dompierre, Ryuichi Sakamoto and Shawn Phillips. Recorded at McGill University's Schulich School of Music last November, the sound quality is warm and resonant. Part of the proceeds from sales of the CD will go to support the Quebec Breast Cancer Foundation. 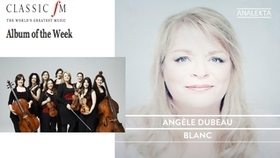 After a fight against cancer, the French-Canadian violinist Angele Dubeau has produced an album of beautiful contemporary pieces called Blanc. Linked by their common evocation of light and peace - all these works Ms. Dubeau says, have personally helped her through her illness. The album consists of 14 pieces from 12 different composers including international movie maestros - Ennio Morricone, Joe Hisaishi and Ryuichi Sakamato - and such varied genres as jazz and folk, as exemplified by the music of Dave Brubeck and Cat Stevens. 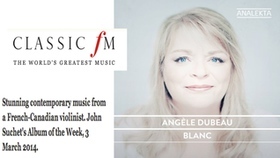 Blanc is the CLASSIC fM CD of the Week. Angèle Dubeau is a sensational violinist and the selection here is serene and heartfelt. She is ably accompanied by her all-female string ensemble La Pieta who turn Morning Has Broken into a rolling, pastoral rhapsody. After a fight against cancer, the French-Canadian violinist Angele Dubeau has produced an album of beautiful contemporary pieces that are linked by their common evocation of light and peace - all works that she says have personally helped her through her illness. The album consists of 14 pieces from 12 different composers including international movie maestros - Ennio Morricone, Joe Hisaishi and Ryuichi Sakamato - and such varied genres as jazz and folk, as exemplified by the music of Dave Brubeck and Cat Stevens. Angèle Dubeau is a sensational violinist and the selection here is serene and heartfelt. She is ably accompanied by her all-female string ensemble La Pieta who turn Morning Has Broken into a rolling, pastoral rhapsody. 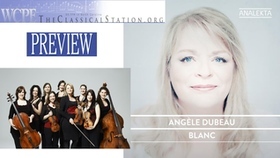 With her latest release - Blanc, violinist Angele Dubeau pays tribute to "everyone who has found strength and serenity through the trials of life." Dubeau recently survived a battle with breast cancer and credits music with helping her to stay the course. The selections on this CD, representing 12 very different composers, reflect the exceptional gifts of Dubeau and her renowned ensemble, La Pieta. For each CD sold, $2 will be donated to the Quebec Breast Cancer . 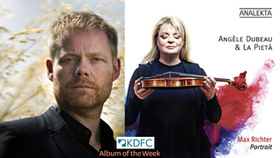 Tune in throughout the week for tracks from KDFC - San Francisco CD of the Week. 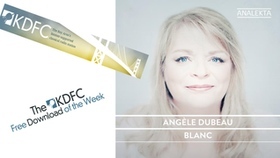 This week's pick of March 24 is Angele Dubeau's Blanc. At almost like period last year, Angèle Dubeau announced she was suffering from breast cancer and she temporarily withdrew from public life, the time to fight against the disease. For the first time in over 35 years, violinist had to postpone concerts, what she had never done before. A few months later, in August, is a flourishing Angèle Dubeau, cured, Quebecers have found the Music Festival Tremblant. And today, the lady launches White, his 38th album, the album that helped him through this ordeal. She clung to his passion, music, and now offers its loyal fans the fruit of his months of introspection. "This record tells a story, my story, that of a woman who, like many others, had to fight against the disease and serenely grown in spring, said Angèle Dubeau in a statement Tuesday. White is like purity, serenity. White to light music which, by their size and their evocative power, can bring inner peace. " 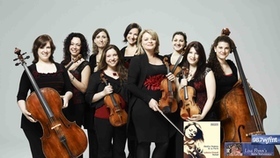 On White, internationally renowned musician takes with his female string orchestra, La Pietà, 14 pieces of 12 composers from very different backgrounds: Garry Schyman, Osvaldo Golijov, Adrian Munsey, Marjan Mozetich, Joe Hisaishi, François Dompierre, Ennio Morricone, Mark O'Connor, Ryuichi Sakamoto, Dave Brubeck, Cat Stevens and Shawn Phillips. 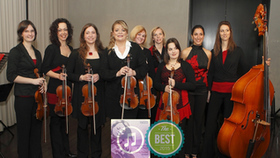 Some of these employees are raving at the talent of Angèle Dubeau. "Angèle Dubeau know also paint when she plays," illustrated Russell Gloyd, a partner working long, comparing the bow of the artist brush and his violin, a palette. "It gives me almost like seeing something I had lost, so his game is worthy, tender and touching", for his part, said Joe Hisaishi. Marjan Mozetich, meanwhile, spoke of the brightness of sunlight, and a sunrise gradually reaching its full morning glory, to describe the emotions that music generates Angèle Dubeau home. White was released on the Analekta label, the label owned by François Mario Labbé, spouse and manager of Angèle Dubeau. For every copy of White elapsed, $ 2 will be donated to the Foundation for breast cancer in Quebec. The album is currently on sale. 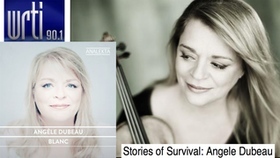 This release by Quebec violinist Angèle Dubeau is dedicated specifically to Dubeau's fellow survivors of serious illness, in her case cancer, expressing the aim of "luminous music that can bring interior peace through its strength and powerful evocation." As such it might seem to differ little from any number of other crossover releases filled with mellow tunes. But Dubeau's album has reached the Canadian top ten, indicating that plenty of healthy buyers have found it. What sets it apart from the competition is first the variety of the music that gets fit into the basic middle-of-the-road template, and second the rich string arrangements that surround Dubeau's violin and its piercing yet sweet tone. Her version of Cat Stevens' Morning Has Broken (track 6) sounds like one of the lush Japanese string orchestra Beatles arrangements from the 1960s. 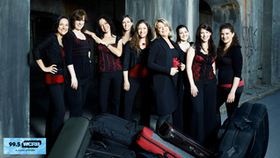 But even better is the mixture of tunes that Dubeau and her all-female ensemble La Pietà adapt for their purposes: the music is a good deal more heterogeneous than it may seem. Try to find another album on which Stevens coexists with Osvaldo Golijov, Ennio Morricone, Ryuichi Sakamoto, and even the iconoclastic American-South African rocker Shawn Phillips. Ultimate reactions to this album will depend on how listeners feel about an entire program of uniformly moderate-tempo and tonally plain melodies, but anyone may find Dubeau's release more effective than expected. 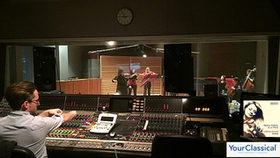 Studio sound from a multimedia center at McGill University in Montreal is a major plus. Silent night! Holy night! Hearing just a few notes of this eternal carol is enough to envelop us in a sweet tranquility and inner peace that goes well beyond the meaning of the words written by Joseph Mohr and music famous song by Franz Xaver Gruber. Jumbled memories arise of snow-covered countryside, crackling fires, delicious aromas filling the house, the joyful shouts of excited children unwrapping presents. Has Christmas turned into mere nostalgia, or can we rediscover the true meaning of this celebration? Angele Dubeau thinks we can and, through both popular songs and carols works associated with the Nativity, she offers here a voyage through a world with diverse origins and traditions. This musical tour and celebration of the Nativity will take you to Finland, Italy, France, Germany, Austria, the United Kingdom, Russia, and, closer to home, Mexico and Canada, with the Huron Carol. God Jul! In Scandinavia, Christmas celebrations begin on December 13, the feast day of Saint Lucy, when a young girl is chosen in each village to represent her. Clothed in white and a crown of candles, she goes from house to house-along with a retinue of girls in white dresses and boys with pointy, star-spangled hats-bringing light, the symbol of life and renewal, for the coming year. In Finland, the official festivities begin with a declaration of "Christmas Peace" broadcast live on December 24 from Turku Cathedral. A few moments later, Christmas bells ring out across the country, as conveyed by Joulun Kellot ("Christmas Bells"), an interpretation written by Armas Toivo Valdemar Maasalo. Juleniss, the Finnish equivalent of Santa Claus, rewards good children during the night that follows; one wonders if he is tempted to hum the song Julvisa ("Christmas Song", subtitled Give me no Splendour, Gold or Pomp), written by a young Jean Sibelius Buon Natale! While Christmas in Italy might first bring to mind panettone, a Christmas sweet bread invented in Milan around 1490 that is served stuffed with cream, topped with a sauce or covered in chocolate, the country is above all the cradle of the Nativity scene. Indeed, Francis of Assisi created one of the first "living" nativity scenes in 1223, with villagers playing various character roles. Whether miniature or almost life size, these reproductions of the manger scene quickly became a tradition, with Italian families setting them up nine days before Christ's birthday. It is not surprising, then, that two of Italy's most well-known Baroque composers, Antonio Vivaldi and Guiseppe Torelli, dedicated idyllic concertos to "the holy birth." Joyeux Noël! In France, cantiques de Noël remain the most important part of popular celebrations of the Nativity. By the 16th century, numerous versions of these carols existed in a variety of regional dialects, and they were distributed by door-to-door salesmen who also carried "Christmas Bibles" and engraved prints (often with a carol on the back). Here, Angèle Dubeau performs Noël nouvelet, Laissez paître vos bêtes and La Vierge à la crèche, set to a text by Alphonse Daudet. Fröhliche Weihnachten! In Germany, Christmas is Weihnachten (holy nights), and this is where the tradition of the Christmas tree originates. Legend has it that Saint Boniface (ca. 680–754) used the triangular shape of the evergreen tree to explain the concept of the Trinity to the pagans. The first mention of the modern Christmas tree dates back to 1521 in the Alsatian town of Sélestat. Even before this, however, the Christmas mystery plays performed in church squares frequently made use of trees decorated with fruit, offerings, decorations and candles (the candle tradition being attributed to Martin Luther). Two centuries later, Johann Melchior Molter wrote a delicate concerto grosso, inspired by the scene of the adoration of the shepherds. ¡Féliz Navidad! In central America, Mexicans celebrate Las Posadas (the inns) which, starting December 16, commemorates Joseph and Mary's search for lodging. As night falls, a procession sets off, led by children carrying a small decorated platform bearing statues of Joseph and Mary, who is riding a donkey. As the procession of villagers winds through the streets singing litanies, they knock at various doors along the route. Each time they are turned away with the cruel words "There is no room," until the procession arrives at the appointed house or church. Then, the doors are flung wide in the open spirit of Christmas and the celebration begins, concluding with the breaking of a piñata, refreshments and dancing. The lullaby performed here, entitled "Sleep, Holy Infant", comes from Dave Brubeck's Christmas cantata, "La Fiesta de la Posada", written to a text by his wife, Iola Brubeck and arranged by Russell Gloyd especially for Angèle Dubeau. Upon hearing the recording, Mr. Brubeck's reaction was: "This is fantastic. She is playing from her heart." Hristos Razdajetsja! Orthodox Russians have always liked to transform religious events into celebrations, hence the string quartet Jour de Fête by Alexander Glazunov After the church service, everyone sits down to "Holy Supper," which cannot be started until the first star appears in the sky, an homage to the star that guided the Magi. After the feast, tradition dictates that a plate of braided bread called kalach is left on the table between two candles, in honour of deceased members of the family. Angèle Dubeau offers here one of the rare recordings of this work. Merry Christmas! Christmas is celebrated enthusiastically in the United Kingdom. Houses are decorated with bright lights, children sing Christmas carols (such as "Holy Boy" by John Ireland) in the street, collecting spare change for the poor, and Christmas pudding is the traditional post-Christmas-dinner dessert. Another important tradition began here: the sending of Christmas cards, a custom that began in the 15th century and expanded significantly in the 18th century with the development of lithography. Jesous Ahatonhia The Huron carol Jesous Ahatonhia (Jesus is born) was written by the Jesuit Jean de Brébeuf in 1641. Hoping to better convey the meaning of Christmas, the priest adapted the text to the reality of the First Nations people. Hence, Jesus is wrapped in rabbit skins, he sleeps in a bark lodge, the adoring shepherds are replaced with hunters, and three Indian chiefs take the place of the Magi. Canadian composer Kelley-Marie Murphy based her work Huron Carol Interlude on the carol. The interlude of the title refers to the third movement of her string quintet Dance Me Through the Panic, from which she borrowed shimmering colours and a sense of melancholy, imbuing the carol melody with a very particular mood and evoking, in her own words, an "imagery of ice, snow, solitude and prayer." When she heard this Angèle Dubeau's rendition of her work, the composer wrote: "This is a wonderfully performed and produced interpretation of Huron Carol Interlude. There is a rich, full sound, with a perfect sense of pacing and colour. It expresses my ideas beautifully. Heartfelt thanks and congratulations to Angèle Dubeau!" 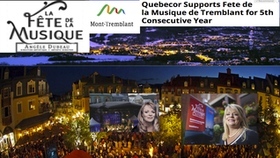 Quebecor is proud to be associated with the Fête de la Musique de Tremblant for the fifth year in a row. 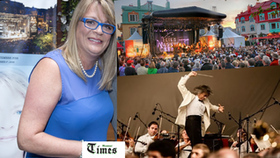 For the music fest's 15th edition, to be held from August 30 to September 2, artistic director Angèle Dubeau and her team have put together a rich and varied line-up of established artists and up-and-comers from every musical genre from classical to jazz, to world music. In addition to providing financial support, Quebecor is backing the festival with a promotional campaign in its media outlets, including Le Journal de Montréal, the daily 24 Heures, the Canoë web portal and its community newspapers. This classic block stacking arcade era game Tetris, much like PacMan and Space Invaders, has become beloved and timeless. On Game Music, Angele Dubeau and La Pieta use the original synth laden game theme and dramatically balance the arrangement through contrast with the orchestra. ‘Game Music', the latest release from violinist Angele Dubeau, re-imagines game themes from their most iconic titles. Set in an apocalyptic battle for survival in the 26th century, the Halo franchise is among the most important gaming sagas ever. Made exclusively for the Xbox console, Halo 1 was a breakthrough in first person shooters by adding a level of realism and sophistication that had not yet been reached. Choosing to shy away from the infamous choral theme from the first game, Dubeau creates a rendition of Halo 3's ‘One Final Effort.' Check out the video above. No game since Halo has produced such stunning graphics and developed storyline, evidenced by it's 50 million copies sold to date. The game has become so popular that you will even find its protagonist ‘Master Chief' immortalized in Madame Tussauds Las Vegas museum. 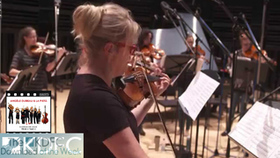 Angele Dubeau, one of Canada's premier violinists, and her all-female string orchestra are bringing a classical flair to some of their favorite video game music. After last years release "A Time For Us," which covered music from popular movies by composers like Howard Shore and John Williams, the group has turned its sights to the gaming world. "I have always strived to interest young people in classical music because I feel it has the power to touch everyone. Seeing the passion of young people for video games, I wanted to understand the secrets of their success and to evaluate their musical value," says Dubeau. 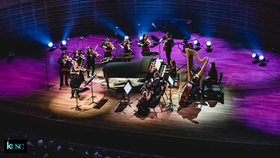 And so in their latest release, aptly titled "Game Music," Dubeau and company are covering the themes to all manner of video games. 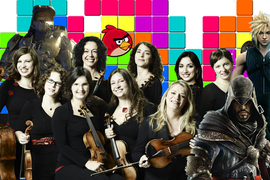 From the iconic Tetris theme (itself already an arrangement of classical music from both Russian tradition and Johann Bach) to the theme from the iPhone's breakout hit Angry Birds the group has covered a wide range of gamer music. Avoiding some of the more obvious hokey themes that get trapped in gamers heads (think Mario) the group has instead focused on games with already beautiful soundtracks such as Final Fantasy, Assassin's Creed, and Halo 3. "I wanted to avoid distorting [the songs], and my intention has been to preserve the form that initially won over video game aficionados while at the same time breathing new life into them." 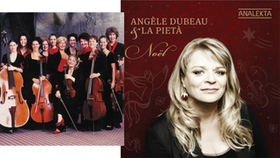 Analekta is proud to present Angele Dubeau & La Pieta's new album, A Time for Us. The CD features an array beautiful film scores, all favorites of the virtuoso violinist who has led a dazzling career in the great concert halls of the world. In this album you will discover pieces by Howard Shore (Lord of the Rings), John Williams (Memoirs of a Geisha and Far and Away), John Barry (Dances with Wolves), Nino Rota (Romeo and Juliet), and many more. The album also includes My Heart Will Go On, in a setting by Claude "Mego" Lemay. As a bonus, the album includes five other film music tracks, featured on previous albums of the ensemble, including the unforgettable theme from John Williams' Schindler's List and Franois Dompierre's Fairy Tale.